A few years ago, you could walk some distance out to Arabian Sea at Alappuzha beach in kerala, on the wooden boards of the dock, and see the blue waters through the clefts. The ebullient waves would then tell you a story, of the proud 'Venice of the East' that was once the gateway to Kerala, much before Kochi signed off as a harbor of choice. Over the pages of history, Alappuzha dropped its past and blended with the future, more like an oil film, floating on the surface of water, while shielding cultural treasures deep inside its heart. Everything about this town flaunts that by gone feeling - the colonial era government mansions, still grand and graceful despite the years, the canals, green and coated with weeds, filled with boats carrying hay or bananas. 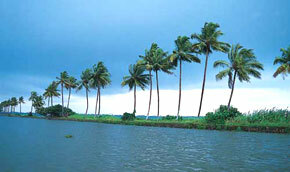 Enjoy Alleppey beach vacations in Kerala India. Plan a holiday tour to the exotic Alappuzha beach where you can even enjoy the fine art of doing nothing. Far from the pressures of the outer world, this fine excerpt, fringed with rows of palms, surely help tourists to wash away all negative thoughts and return with a clean soul. Engage yourself in the merriment of sand art, stretch yourself under the sun and get a cool tan on your skin, or you can just jog around, sinking your footmarks into the heart of the pristine white sands, that dot the landscape. Try this. Get up on an elevated pad and look down upon what surely be the best view of famous Alappuzha beach. From up there you would see kites circle above the dense plantations in the foothills. And you'd see wave upon wave of surf pound the beaches, each enticing layer filled with a promise of different experiences in Indian shores. And you'd see a paradise for the adventurous. Take up beach tours of Kerala to see the major attractions of the popular Alappuzha beach. 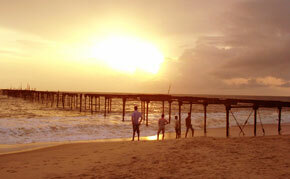 Of course Alleppey beach vacations will reverberate to a wonderful past. It was once the busiest coast south of Mumbai, and its canals and backwaters helped in the smooth passage of cargo - be it tea, rubber or spices from the hills of Western Ghats - to the sea. The lighthouse and the 1000-ft long pier, built by Captain Hugh Crawford in 1862, which once helped the boats ferry across and augmented trade in their own way, now stand as a mere skeleton of the past. But a visit to these relics surely adds some special effects to a holiday tour, for they breathe an unavoidable colonial air. The bricks have mostly fallen apart or been imbibed by the sea, and an entry to the lighthouse is restricted by the tourism department. Spend the second Saturday of the month - if you plan to visit in August - beside the Punnamda Lake, near Alappuzha, and behold the grand event of Nehru Trophy Boat Race, the most popular in its fraternity. The morning of this competitively fought boat race is marked by a sudden change in the ambiance - about two lakh people, including tourists from abroad, gather to watch the event. 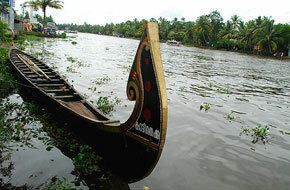 The major attractions of the boat race in Kerala is the competition of snake boats or 'chundanvallams' as they are locally known. The 100 feet long boats with a raised prow, surely cast a spell when they traverse through the ebullient waters of the lake. Alappuzha beach in Kerala is located on a thin strip of land, sandwiched between the Arabian Sea and the Punnamada backwaters. Tourists can fly up to Kochi Airport in Nedumbassery and can get a cab to travel the rest 90 km towards south of the state. One can even drive on NH 47, which links Salem to Kanyakumari. If one is willing to travel by bus, reach Alappuzha's KSRTC bus stand, situated at 5 km from the railway junction on NH 47. The bus head is superbly connected with all major tourist destinations and has frequent bus services to Ernakulam, Kottayam, Kollam and Trivandrum.